Specialty CME Credits:: Included as part of the 4 credits, this CME activity is eligible for 2 Pharmacology CME credits, subject to your state and institutional approval. Pelvic inflammatory disease is a common disease that is associated with significant complications including infertility, chronic pelvic pain, ruptured tubo-ovarian abscess, and ectopic pregnancy. The diagnosis may be delayed when the presentation has nonspecific signs and symptoms. Even when it is properly identified, pelvic inflammatory disease is often treated suboptimally. 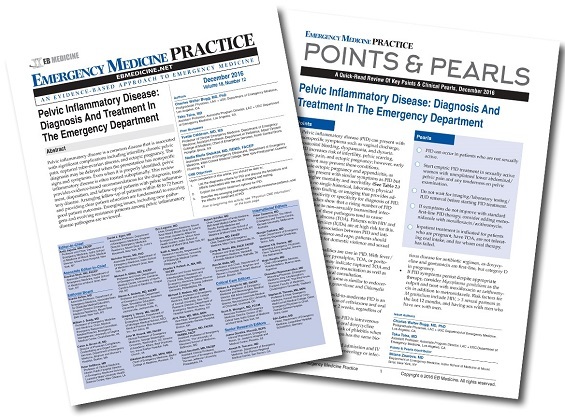 This review provides evidence-based recommendations for the diagnosis, treatment, disposition, and follow-up of patients with pelvic inflammatory disease. Arranging follow-up of patients within 48 to 72 hours and providing clear patient education are fundamental to ensuring good patient outcomes. 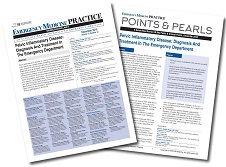 Emerging issues, including new pathogens and evolving resistance patterns among pelvic inflammatory disease pathogens are reviewed. You arrive for your shift in the ED. The final patient you are signed out is a 30-year-old woman with lower abdominal pain whose ultrasound results are pending to rule out torsion versus ovarian cyst. You nod dutifully and go about seeing new patients. An hour into the shift, the clerk hands you the ultrasound results with the radiologist’s impression: “No radiological etiology of patient’s abdominal pain is found.” You review the chart and confirm that there is no concern for any nongynecological etiologies for her pain. The previous physician documented mild left adnexal tenderness without cervical motion tenderness or adnexal masses. Labs are notable for a urinalysis that is small leukocyte esterase positive and nitrite negative, and a wet mount without clue cells, yeast, or Trichomonas vaginalis. You confirm the documented history with the patient, who additionally denies any urinary complaints or flank pain. On your physical examination, you note only mild left lower abdominal tenderness. As the patient asks, “Why am I having this pain? Can I just go home?” you wonder if there is something else you should do. This article was informative and concise. I will be more diligent in treating for PID when the patient has lower abdominal pain and another etiology has been ruled out. As a result of this course, I will have greater sensitivity as to when to diagnose and treat PID, and I will change my initial treatment regimen to follow current CDC guidelines. This was a great review of a bread and butter topic.